Nowadays, it is extremely common to see an array of people with tattoos. However, this trend has not always been entirely accepted by the public. With times changing and more and more beautiful artwork and artists emerging, it is completely understandable why tattoos are so commonly seen in society today. Tattoo artists and artwork have come a long way. Typically the question associated with tattoos is: why did you get this? Some people have reasons as to why they wanted tattoos; some people do not. A lot of backlash used to be associated with spontaneous tattoos, but in society nowadays, it seems like this has become more of a normal occurrence. Getting a tattoo done without a complete plan or meaningful reason is perfectly respectable and common, this generation is one who has experimented and brought on an abundance of new trends and styles. 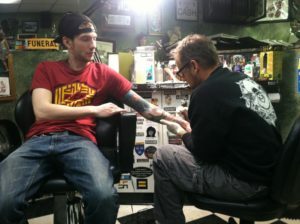 According to a blog post on TattooConnection.net, 36% of those ages 18 to 25 in the United States have at least one tattoo. Body modification just so happens to be a movement that took the world by storm. Unfortunately, a lot of resentment is still sometimes directed toward people with artwork on their bodies and it is ultimately unnecessary. For whichever reason a person may choose to get a tattoo, that should be respected and criticism should not be directed to someone with tattoos. Despite the criticism, tattoos do not impact the way employees do their jobs. Students, teachers, and everyday people all over the world have tattoos for various reasons, and regardless of whether a person likes it or not, this should be respected. HCC students who have inked their bodies spoke out about their feelings toward tattoo acceptance and why this trend should be more welcomed rather than shunned. “I do have a desire for tattoos someday if I figure out exactly what I want,” says Imi Pogacsas, a 24-year-old HCC student, “It’s super accepted in my opinion. The only thing I could think of that would be negative about tattoos would be they are associated with gangs, but that’s not even really happening too much anymore.” Pogacsas does not currently have any tattoos, but sees nothing wrong with people who do. Former HCC student Lucas Pizzagalli has a large appreciation for tattoos and quite the collection covering his body. 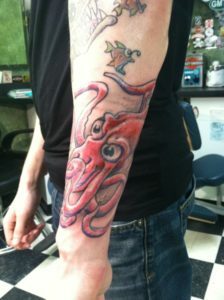 Pizzagalli has all of his tattoos done at Green Man Tattoo in West Hartford, Connecticut and shared his viewpoint on ink itself. Green Man Tattoo is a well known tattoo shop that won The Hartford Reader’s Poll for Best Tattoo Parlor this year. Kenny Adams, one of the shop’s owners, agreed that there is more than meets the eye when it comes to the reason behind not only getting tattoos, but giving them as well. With such popularity in the tattoo scene, it is no wonder why a vast majority of the population are choosing to ink themselves. Despite this, the idea of body modification is still foreign to some others, and with that comes harsh criticism. Some people have opposing opinions and that is okay. Whether a person wants a tattoo or not, there should be no disrespect for the decisions someone decides to make. Fortunately, society has become more accepting of tattoos, giving the opportunity to those with body art to show it off freely.